Philip Booth is a great guy .. choirmaster of All Hallows Church, Twickenham, East of London, UK. I like to help out the choir and also to take pics. The Sony R1 is a great camera .. the swivelling LCD Screen mans you can take ground-level shopts without being mistaken for an over-devout worshipper. I used as Ricoh GX8. This is the altar and the massive carving behind it was done by Grindling Gibbons, who was a mate of Cristopher Wren, the guy who designed St Paul's Cathedral in London. 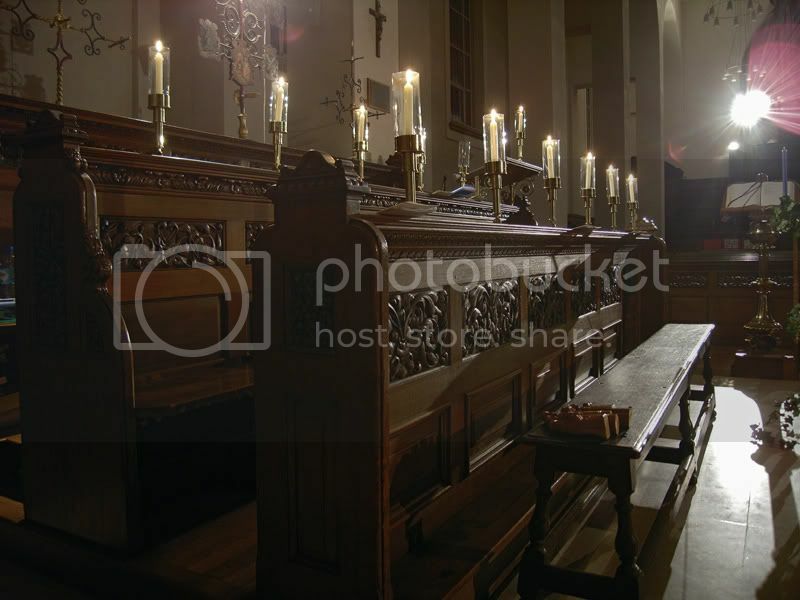 Here are the DChoir stalls. Note the candles. They were originally to illuminate the sheet music, but as often as not would set them on fire. 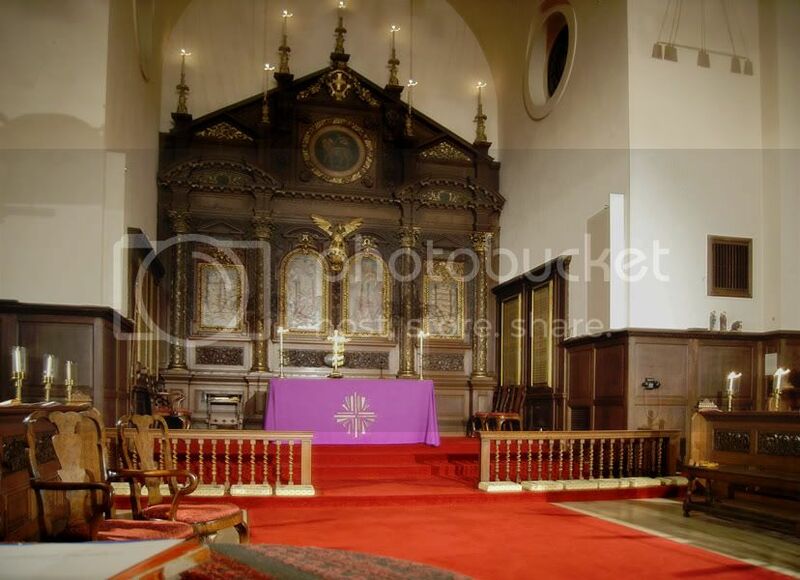 And here is the pulpit from which the priest delivers the sermon .... note the area without fill-flash ... if you cold see it you woul notice that it is a parabolic section, the axis slightly aiming into the congregation. 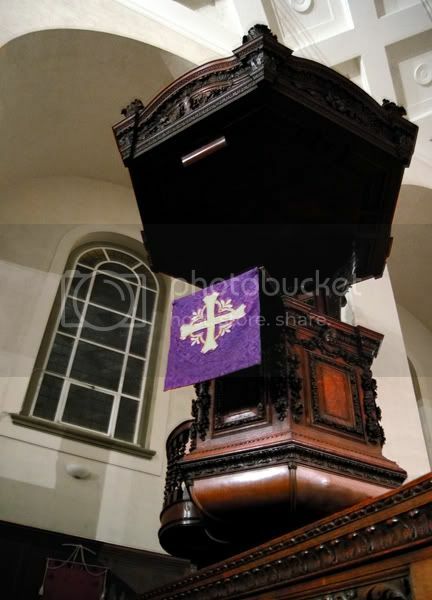 The pulpit is actually acoustically tuned to the hall to amplify from a head-height point source. Theimages you shotconvey the solemn atmosphereof the interior. I especially liked the second one. The solumn aspect is, I believe intensified by my feelings as I take these pictures ... they are done during the break between the choir rehearsal and the actual service. I am not a congregation member, but I am member of the 'extended' church choir .... I come along to help out on special occasions. The mood does influence me ... and also, these are pictures that i know I am going to present to Philip .. the choirmaster I mentioned at the top of the thread. He really IS a great guy. So'who am I doing this for' adds to my solemnity.